The weekend is here and the playoffs are just weeks away. You can feel the tension on the field and everywhere else at the moment as teams hustle to finish the season on a good note and reach the post season – while some clubs are just playing for pride and for 2013. We have a full slate of games this weekend, and below are my predictions for each game that are sure to be dead wrong by Monday morning. Chicago Fire at Sporting Kansas City: This is a bend but don’t break game for both clubs. Each are doing very well at the moment and both know what this game means in terms of playoff positioning and potential home field advantage in the post season. Some observers continue to ask if this Chicago team is for real, and honestly, they are. I said in the preseason that they were my dark horse selection from the East and I’m glad I stuck with that feeling. But can they slay the beast that is Sporting KC? It won’t be easy and it will certainly come down to a late goal. But I feel like this one is a draw. Toronto FC at New York Red Bulls: Toronto games from here on out are just worthless to pick, especially road games. Don’t even blink, just pick New York to win by a save margin. Philadelphia Union at Columbus Crew: The Union are playing for their season at the moment, one more loss and they are toast. But don’t sleep on them in this one as they’ll push Columbus late. The thing is about this Union squad, they just don’t have the answer to Columbus’ up front. Still, the Crew will leave it late like they have in their last couple of wins. New England Revolution at Houston Dynamo: Another one of those simple predictions. New England has talent, that much has been said before about this squad this season, but they lack so many little things on the field. A trip south to Houston won’t be easy and the Dynamo should have enough to get the job done. Seattle Sounders FC at Vancouver Whitecaps: A big one for a couple of reasons that I laid out yesterday. While I don’t see the Whitecaps being able to close this one out again, I do think they’ll give their rivals a bigger push than what we’ve seen out of them over these last two months. I’d expect a physical game between these two sides and one that could come down to a costly card, or two. Taking Seattle seems like a good bet but a draw seems more likely given Vancouver’s need for points and desperation. D.C. United at Portland Timbers: This here United fans is what you call a trap game. After three nice wins without Dwayne De Rosario, the club has to head west for their final big road trip of the season. That won’t end well in my book. Real Salt Lake at Chivas USA: The ol’ expansion partners game. Salt Lake will be missing a couple key defenders in the back with Jamison Olave being suspended. I don’t think it will help Chivas as much as some might think. You have to recall that Chivas still has the worst offense in the league to date. Still, saying all of that makes me think this one will end level – RSL needs to prove again to me that they can get hot before the playoffs. Right now, I’m not sold on the fact that they can be. FC Dallas at San Jose Earthquakes: Folks seem to forget that FC Dallas has played San Jose very tightly this season, earning more corner kicks and more shots on goal than any other club. In those previous two meetings Dallas was without Blas Perez and one of those games saw a meltdown from Brek Shea. Fast forward to today and this is an entirely different and better Dallas squad that is determined to get points. 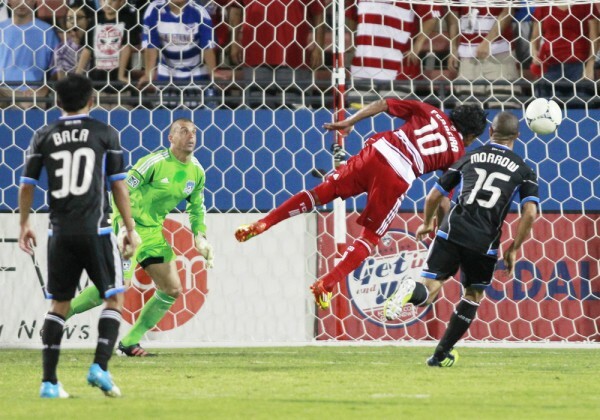 This one will come down to a late goal, as most games with the Quakes usually do. But I think it ends level, San Jose is too good offensively and Dallas still has some issues even though I think their offense will push the Quakes in this one. LA Galaxy at Colorado Rapids: For LA the task is simple, just keep winning and a home field playoff position could be in their grasp. LA should have their first team choice for this one and if that is the case, I don’t think Colorado has enough to handle all the firepower that LA possesses.